During the night we have a power out and the air con stop working. We wake up covered in sweat with probably thirty degrees in the room around three in the morning. I’m not a morning person even though I’m used to getting up early. Katja’s unconditional love is what keeps her in acceptance of my morning mood. I grunt and grumble and walk around in the room looking out the windows to see if it’s a larger power out, click on all the switches and grumble some more. Finally the power is back and I get the air con going again. I collapse in the bed and toss and turn for what seems like ages. When the alarm goes off two and a half hour later, I’m in no mood to do yoga. Katja is the group’s morning person and head out the door while I turn over and fall asleep again. I have little recollection of the mornings conversation. When she’s back we do a quick breakfast before heading out. We’re doing a Vietnamese cooking class today. The Ben Thanh market is our meeting spot and we meet our guide Cam and the chef Mr. Tian. The ingredients we need are all at the cooking school, but we go around the market and learn about different vegetables, fruits, herbs, fish, frogs, pork and more. The market is big and have a lot of different areas. The wet market includes pork brain, live eel and frogs. 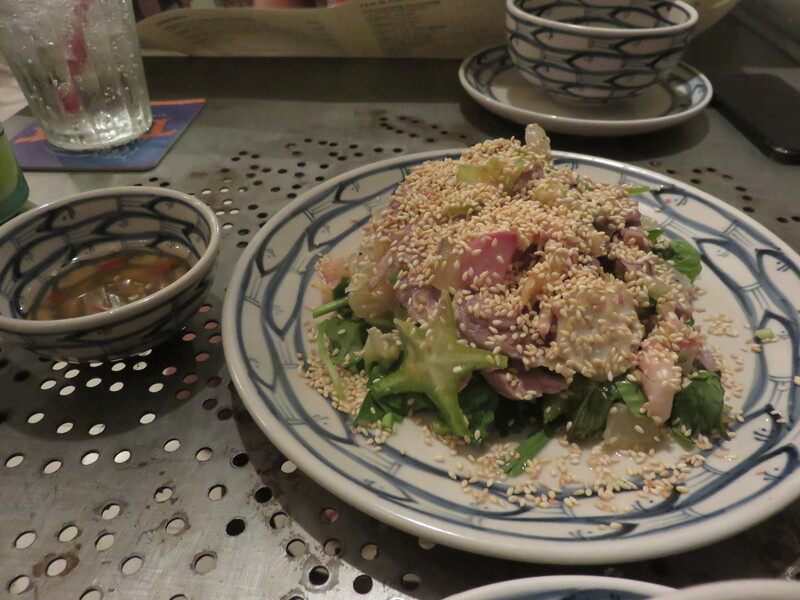 Of course you’ll find more traditional items like snapper and other known fish. We take a taxi to the cooking school which is located across the street from the shopping mall we visited yesterday. In the car Cam asks if we know of the “Passion” shopping mall. We can’t say that we do, and we thought we had googled them all. From the balcony up on the fourth floor we see the sign of the “Parkson” shopping mall. Passion/Parkson… Ok. Since its just the two of us everything is slow and easy. We have all the time I the world and we make food after our own request. Katja emailed them a few says back and requested this menu. Good choice. Everything tasted really good, but there is lot of sugar used in this cooking. We do believe the southern cuisine is using more sugar than the northern. At least it feels that way. We spend the morning there and head back to relax a little in the room around one o’clock. Given tonight’s bad sleep we both take a nap. We had plans but we postponed them. Nothing feels so good as a guilty pleasure. You know, like sleeping an afternoon nap. We get out and walk to the Ben Thanh market. We walk slowly through the stalls that sell all kinds of junk and the occasional gem. The sellers, or hawkers, are very alert. They touch you and want you to buy. The fact that they sell absolute crap don’t seem to bother them at all. Katja’s been looking for a fan and finally find one of right size and with the right decoration. Good for her. I’m offered ties, shoes, bags, t-shirts, coffee and several artifacts I can’t name. Nothing sticks. We take a taxi up to the opera house. This is one of the landmarks in HCMC. It was certified as a national relic in 2012 and it’s built in 1898. At the 300th anniversary of the founding of Saigon, that coincided with the 100th year anniversary of the opera house, it was restored. It’s located next to hotel Continental and the Hyatt hotel in a fashionable part of the city. We’re here to see a show. We found the show yesterday at the war remnants museum and bought tickets there. It’s the first contemporary cirque performance here in HCMC and use acrobatics, contemporary dance and bamboo cirque. We’re intrigued as we had a great experience with the Phare show in Siem Reap Cambodia. It’s a no photo and video performance so there’s nothing to show, but it was good. It had a lot of great acting and the dances were very well choreographed. It lacked the sore and vulnerable feeling of Phare, but it’s highly recommended if you’re in town. Waiting at the opera balcony. We had a reservation at a restaurant up the street from the Opera. It’s a cool place, but the food is to contemporary to suit us. The fresh spring rolls are ok, but the beef shank was so strange even Katja couldn’t finish it. We didn’t really spend much time there as the level of noise rose as the number of guests did. 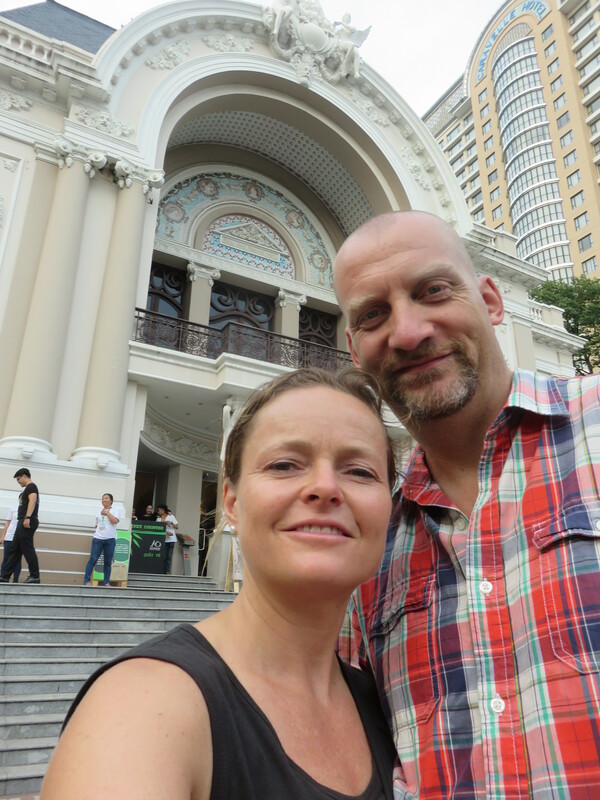 We walked down towards the opera and from there to the plaza along the Nguyen Hue road. It’s a big open space where lots of people are gathering on this Friday evening. It’s people of all ages and everybody seems to be having a good time. There’s no alcohol to be seen and I’m not sure if there’s a law regulating it or if the Vietnamese drink less in the cities. We’ve been told they drink with both hands until stupor in the countryside. We walk and talk for a while before getting into a taxi and drive down to the hotel. We walk in the neighborhood of the hotel and look for the street baguettes that Vietnam is known for. No luck there, but we found a restaurant that could provide me with a sandwich to go. The streets are busy here in HCMC in a very different way than in Hanoi. It’s more “dirty” in a way, with bars, girls in short skirts trying to sell you happy hour, English menus and football on the telly.